Wir hatten 3 schöne Tage in Cadiz und haben uns im Hostel sehr wohl gefühlt. Die Lage war toll,alles war in der Nähe,es war ruhig,die Mitarbeiter sehr nett und zuvorkommend. Das Hostel ist zu enpfehlen! Great hostel, nice room and really nice people! Clean kitchen and bathroom. The location is very good. Superclose to the beach (10 min walking) and to the cathedral and beautiful centre of Cadiz! A nice place for resting out! :) Cosy! 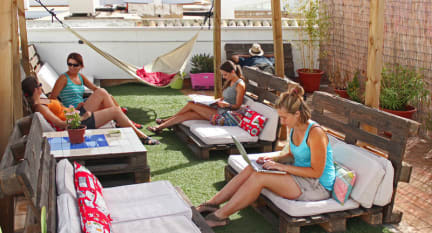 Liked it so much that I also went to there Granada backpackers inn. Location, people, atmosphere, ... The rooftopbar is great and they organise fun activities. The location is ok and there is a lot nearby f.e. an etm, supermarket, bars, etc. Nice and friendly staff. Fun people looking for a great time. The kitchen was clean and had enough aquipment to work with. Breakfast very simple but ok. Should be a bit more diverse though. Cadiz is a nice place for a short stay and the hostel suits this. Zeer gehorig, zowel in de hal als snachts voor op straat. Kost je wel je nachtrust. Mensen zitten snachts voor jou deur te bellen.